Today (Friday, Dec. 16, 2016), Boeing and the Society of Professional Engineering Employees in Aerospace (SPEEA) announced 2017 salary adjustment funds. 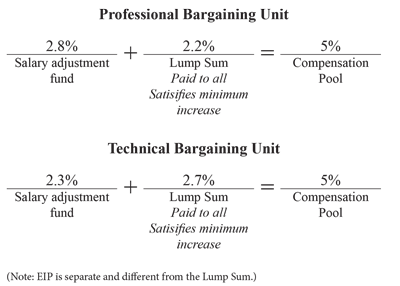 Contractually required market comparisons unexpectedly determined that employees would only be eligible for lump sum distributions of an overall five percent fund, but Boeing has decided to provide salary adjustment funds of 2.8 percent for engineers and 2.3 percent for techs. "This is consistent with our belief that business success starts with our people and relationships," said Todd Zarfos, vice president of Engineering Functions, Washington Design Center and senior chief Engineer of Systems. "Rewarding individual performance helps us attract and retain the best talent, while inspiring the pride, energy and passion that employees contribute to the company." SPEEA Executive Director Ray Goforth added, "In deciding to provide these salary adjustment funds for our professional engineers and techs, Boeing went above and beyond what was required by the contract. This is appreciated, and I believe, an outcome of the improved relationship we've been developing." Boeing and SPEEA negotiated the contracts for engineers and techs in February, 2016 with a provision that salary adjustment funds are established from a pool of money of 5 percent. That 5-percent pool is further divided into two types of funds: one for salary adjustments, and one for lump sums. The size of the salary adjustment fund is then determined by comparing the average salary of Boeing's employees in those units to the average salary of comparable employees in the market, with the annual Mercer-SIRS High Tech Company salary survey providing the standard. Thresholds for the salary adjustment funds allow averages wages to be 15 percent above market for engineers and 22 percent above market for Techs in 2017. This year's data indicated that both units exceeded their thresholds, meaning the entire 5-percent pool would have been paid as lump sums - no salary adjustments. Boeing, however, has opted to provide a salary adjustment fund anyway. "This improvement to the salary adjustment funds for 2017 allows us to reward high performance and helps us retain key talent with critical skills," Zarfos said. So the company will distribute an overall salary adjustment fund of 2.8 percent and individual lump sums of 2.2 percent for professional engineers, and an overall salary adjustment fund of 2.3 percent, with individual lump sums of 2. 7 percent, for techs.